“Siri Berg: In Color” is the understated title of a nearly 50-year retrospective of the Abstract Expressionist Siri Berg, now at the Shirley Fiterman Art Center. 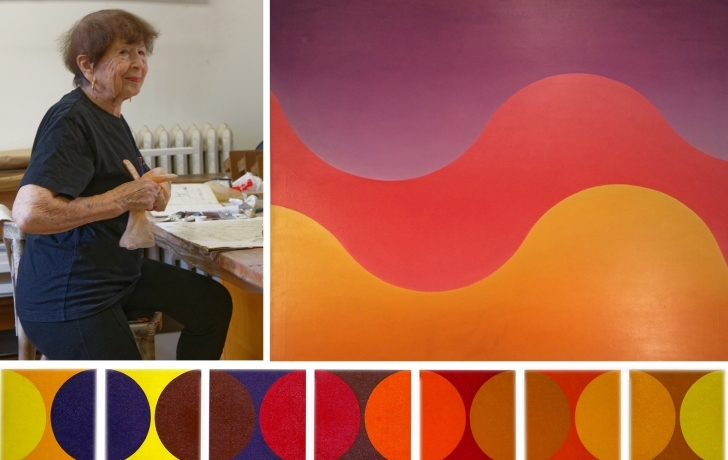 Understated because this painter, who is 95 and still making art in her Soho studio, does not just work in color, she revels in it, creating canvases of unbounded exuberance and subtle beauty. Her treatment of color, often in alliance with shape (mostly circular and rectangular) and texture, can soothe even the casual viewer. Those willing to linger will be rewarded with a new appreciation of color for its own sake—one hue gaining power through the blending or proximity with the next. Berg, who came to the U.S. from her native Sweden at 19, began painting seriously while living in the Riverdale section of the Bronx with her husband and raising their children. "I worked at a bridge table in the master bedroom," Berg recalled recently as she gave a tour of her loft studio where new pieces were in varying stages of progress. "When one son left for college, I moved into his bedroom." In the 1980s, she finally got a studio of her own in Soho, where she also lives. Reviewers have described Berg's work as deceptively simple. "It's a bit like a bento box with beautifully arranged sushi," an observer said in the Swedish publication, Nordstjernan. "It’s abstract art at its most organized and elegant, and her sense of color is simply sublime." "Color is a language," Berg said. "It can talk low, it can talk high, depending on how I feel." There is, for example, the bright multi-panel series It’s all about color (Red Gradation), which begins with a square of yellow and ends with purple as red is progressively added in each panel. But there is also the dark, earthy and almost seamless gradation of tones in Crimson Tide. Reading right to left, it is like the last light of sunset fading into night. When she is only working with color, she says, there is a "oneness. You can exclude everything else in the world." And as viewers, so can we. Thirty-three of Berg's works are on display at the Shirley Fiterman Art Center, 81 Barclay St., until Feb. 4. Hours are Tuesday–Saturday from 12 to 6 pm. The show is curated by Peter Hionas, whose Hionas Gallery represents the artist.